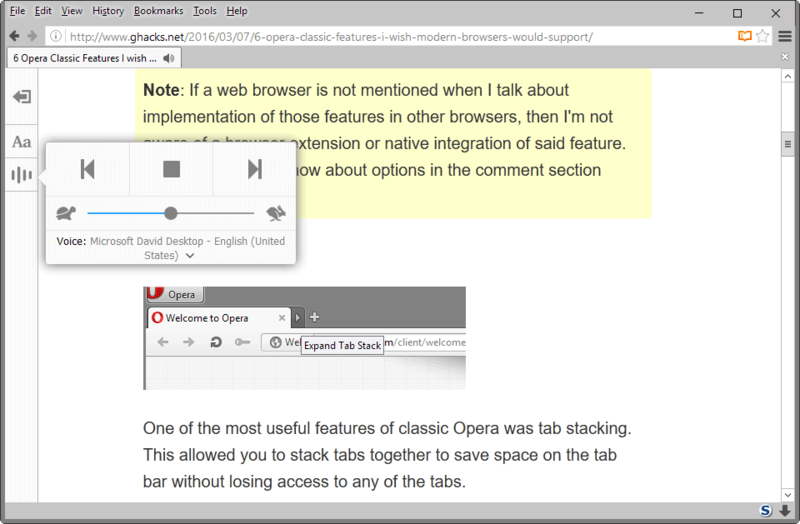 Narrate is a new feature of the Firefox web browser that adds text to speech capabilities to the web browser's Reader Mode. Please note that Narrate just landed in Firefox Nightly, and that it will take a while before it becomes available in other versions of the web browser. Reader Mode is not available on all pages by default. The feature parses the page to determine whether it is suitable for Reader Mode, and will display its icon if the result of the parsing is positive. The icon is displayed on the right of Firefox's address bar where users can click on it to load the page in the mode. If you have ever used a readability extension or service, you know already what Reader Mode does. It streamlines the content on the page by removing menus, advertisement, widgets and other elements that are unrelated to the content. It furthermore changes the layout of the content by using its own stylesheet for text and media displayed on the page. Narrate is a new option that is listed in Reader Mode's sidebar. A click on the feature allows you to enable the text to speech feature so that the text is read to you aloud. You may switch between different voice packages, on Windows 10 those were Microsoft David Desktop and Microsoft Zira Desktop which are male and female voices respectively. Another option that is provided by Narrate is to change the speed of the audio. You may use the slider to speed it up or slow it down, depending on your requirements. The back and forward buttons jump to the previous and next paragraph on the page, and are only active during playback. The audio continues to play even if you switch to other tabs in the browser or even other programs that run on your computer. One interesting feature or Narrate is that hitting stop will have Reader Mode remember the paragraph Narrate processed at that time so that audio playback jumps back to the beginning of that paragraph when you hit play again instead of starting from the very beginning. Narrate seems to rely on installed voice packages on the underlying operating system to function which means that it does not require online access for its functionality but may not be available on all systems Firefox is compatible with. Indeed, and the problem is that it is sometimes available for pages that won’t render correctly and sometimes unavailable for pages that would render correctly. To solve these issues making it always available (Reader icon always visible/accessible in the urlbar) is a logical alternative, leading to the certitude of never missing a “readable” page together with the risk of failure on certain pages, risk which already exists (even if reduced) when letting the Reader Mode decide for itself. With a bit of practice (and logic) you quickly get to spot availability. I’ll have to ask Pants why he proposed to disable the Reader Mode in his “Firefox privacy and security list” when I don’t see any issue with “reader.parse-on-load.enabled” set to true. The readinglist preferences aren’t available in either Firefox Stable 45.0 or Firefox Nightly 48.0. Thanks for the information. I’m surprised because Reading Mode hasn’t been removed neither has Pocket (yet) even if I still don’t know if Reading List was tributary of Reading Mode or of Pocket. Consequently I’ve reset readinglist options (above, complete regarding readinglist) in about:config and indeed all three resume to “” (blank) hence they are no longer in the code. Good to know. Just in case any ghost would wonder what the hell I meant! The Firefox Reading List seems to have been a feature like Pocket but developed by Mozilla. According to the 38.0 Beta release notes, one could “Keep track of articles and blog posts with the Reading List”. It never really went anywhere, since the Pocket integration replaced it. It wasn’t related to the Reader Mode. Roger, All Things Firefox, we copy you on the ground (as they say in Houston Space Center!). Really appreciate your clarifications. If I am clear in my about:config settings I lack sometimes conceptualizing this or that, especially when dealing with features I don’t use, such as this Reading List. OK, got it now, thanks again. I fine Reader Mode in Mozilla Firefox some what good but can’t understand why it chooses to remove images on some articles and not others, even though its still the same website weird. Where is the text to speech on Firefox Android? Narrator depends on privacy.resistFingerprinting=false in about:config. Narrator depends on privacy.resistFingerprinting=false in about:config. Or equivalent in user.js. That’s its default, so just to let people know who are into solidifying their privacy in every way possible. Good thing is, an external reader will still work with it set to true. Orca does.